We currently have around 210 members and are always keen to welcome more. Why not get in touch to be shown round the facilities and to join in a social game? 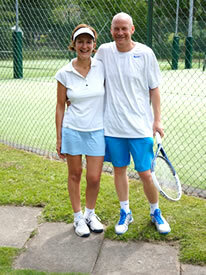 Membership covers the four sports of tennis, padel tennis, squash and racketball. To encourage family membership, large discounts are offered to couples, to children of adult members, and to children in the same family even if their parents are not members. Subscriptions run from April 1st and entitle members to play all sports. Current rates are listed below. There are no entrance fees, and we can accept instalment payments to spread the load. Social membership is available for non-players at £10. We offer reduced rates for those joining after 1 August. Prospective members can obtain an application form by emailing hattonsec@gmail.com. Members need a clubhouse key to gain access to the courts. There is a deposit of £10 on each key supplied, returnable against the key when you cease to be a member. Each member may have an individual key. Members are encouraged to bring their friends to the club as guests. They may participate in any of the sports at a charge of £2 for an adult and £1 for under 18’s. The only restriction is that no-one may play at Hatton as a guest more than six times in a year (because we naturally want regular players to become members).